The U.S. and Afghan President Hamid Karzai are currently negotiating what they call a bilateral security agreement to sketch out the framework for U.S. operations in the country after the end of 2014, when Washington said it would withdraw some or all of its troops. The tensions surrounding these talks reflect the complexity of the situation for the occupiers and their lack of good options. Paul Gottinger: Most of the drone strikes are happening in North Waziristan (Northwest Pakistan) along the border of Afghanistan. Could you give us some background on the culture and the way of life there? Madiha Tahir: These days you can’t get into North Waziristan, which is where 90% of the drone strikes have been happening. So I go to Bannu, which is a border town where people from North Waziristan come during the day to do business, shopping, ect. 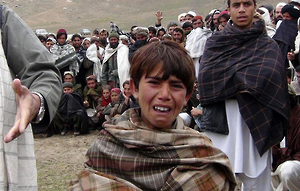 The U.S. War on Afghanistan — I refuse to call it the "Afghanistan war" because Afghans didn't start it — is now 12 years old. Longer than the official American war on Vietnam; it's gone on half a generation, or more. Many people are breathing a sigh of relief to see international combat troops leaving Afghanistan. All foreign combat forces are slated to withdraw by the end-2014 deadline, and many have already gone. Deaths among foreign troops have fallen reassuringly. Yesterday I had the privilege to watch Dirty Wars, an upcoming film directed by Richard Rowley that chronicles the investigations of journalist Jeremy Scahill into America's global covert war under President Obama and specifically his ever-growing kill lists. I will write comprehensively about this film closer to the date when it and the book by the same name will be released. Two young brothers out gathering firewood died after being shot by weapons from a NATO helicopter, U.S. officials said Saturday. The American commander in Afghanistan, Gen. Joseph F. Dunford Jr., issued an apology, saying the killings were an accident. One man is at the center of a story you can’t avoid in the media, since last Friday. General David Petraeus, architect of the U.S. “surge” in Iraq, pulled in to “save” Afghanistan, then bumped over to the CIA last year, was forced to resign because the FBI, we are told, found out about an affair he was having with a fawning biographer.